"Mayors and regional leaders can have a direct and positive impact on the lives of millions through good city-level governance. From our previous years efforts it has been seen that tobacco control policies introduced and well-enforced at this level can become a powerful force for national change. 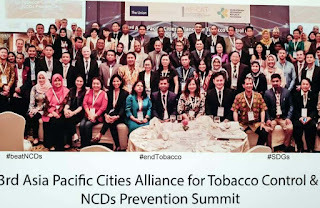 We believe that sub-national leaders can play a leading role to curb the rampant growth of smoking [and tobacco use in other forms] and, in turn, reducing rates of NCDs by ensuring public services are managed with protection of public health as a priority," said, Dr Bima Arya, Mayor of Bogor City, Indonesia and co-Chair of AP-CAT. International commitments for sustainable development “where no one is left behind” are indeed vital but these need to be plugged in the ground realities and translate into positive desired change. 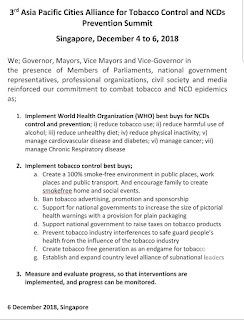 That is why such a strong declaration from local leaders of countries, which are facing the brunt of tobacco use and NCDs, is potentially game-changing. Political commitment is vital at every level and a major determinant of public health outcomes. All local lead-actors need to unite to translate these global goals into effective action towards desired change. Well-coordinated local leadership is central to effective implementation of health and development policies. Khagaraj Adhikari, Member of Parliament from Nepal and former national Health and Population Minister, said (watch video interview, listen to podcast) that local actions are the fundamental building blocks to drive nations, regions and the world towards sustainable development. "We have to make agenda at provincial level, central level and local level leadership is key for implementation. With concerted efforts at all levels, Asia Pacific region will become tobacco-free in coming days", said Khagaraj Adhikari. Dr Tara Singh Bam, Deputy Regional Director (Asia Pacific) of the International Union Against Tuberculosis and Lung Disease (The Union) said that prevention and control of tobacco and NCDs are political choices. He echoed what Dr Richard Horton, editor-in-chief of The Lancet had said earlier this year: “Politics is, in many ways, the ultimate determinant of our health.” Decisions made by politicians determine our well-being in many ways- either way! For instance, strong tobacco control measures yield major public health, financial and development gains. Weakening tobacco control can threaten development. Dr Tara Singh Bam, who has worked closely with AP-CAT leadership since its inception, said that local leaders can implement the WHO recommended tobacco control best-buys by creating a 100% smoke-free environment in public places, work places and public transports, and encourage families to create smoke-free homes and social events. Ban on all forms of direct, indirect and surrogate tobacco advertising, promotion and sponsorship must be strictly enforced. Local leaders should support national governments to take scientific evidence into account and increase the size of pictorial health warnings with a provision for plain packaging. Thailand has become the first country in entire Asia to adopt plain packaging. It is a strong precedent for other Asian nations to follow suit. Likewise, local leaders promised to support national governments to raise taxes on tobacco products. Tobacco industry interference in health policy is the biggest obstacle in implementing tobacco control. 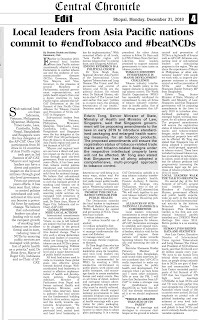 The World Health Organization (WHO) has repeatedly reinforced its commitment to stop all forms of tobacco industry interference in health policy. 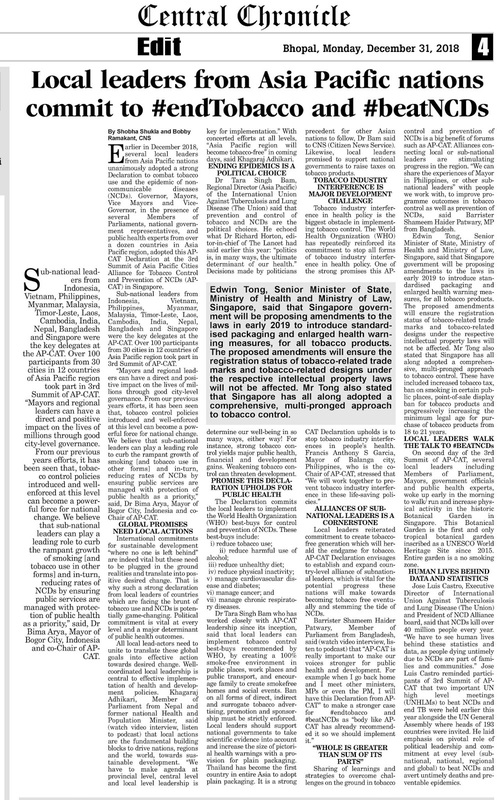 One of the strong promises this AP-CAT Declaration upholds is to stop tobacco industry interferences in people’s health. Francis Anthony S Garcia, Mayor of Balanga city, Philippines, who is the co-Chair of AP-CAT, stressed that "We will work together to prevent tobacco industry interference in these life-saving policies." Local leaders reiterated commitment to create tobacco-free generation, which will herald the endgame for tobacco. AP-CAT Declaration envisages to establish and expand country-level alliances of subnational leaders, which is vital for the potential progress these nations will make towards becoming tobacco free eventually and stemming the tide of NCDs. 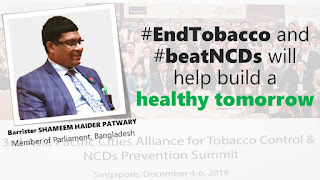 Barrister Shameem Haider Patwary, Member of Parliament from Bangladesh, said (watch video interview, listen to podcast) that "AP-CAT is really important to make our voices stronger for public health and development. 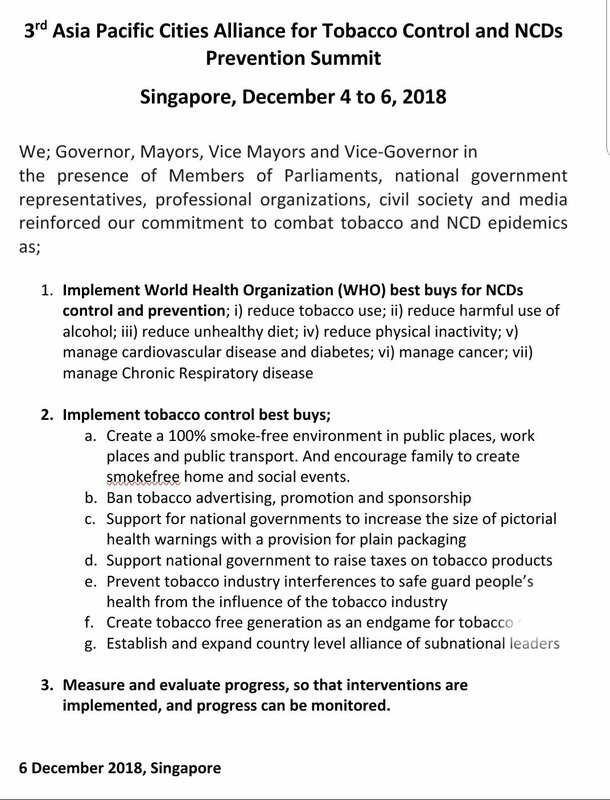 For example when I go back home and I meet other ministers, MPs or even the PM, I will have this Declaration from AP-CAT" to make a stronger case for #endtobacco and #beatNCDs as "body like AP-CAT has already recommended it so we should implement it." "Whole is greater than sum of its parts"
Sharing of learnings and strategies to overcome challenges on the ground in tobacco control and prevention of NCDs is a big benefit of forums such as AP-CAT. Alliances connecting local or sub-national leaders are stimulating progress in the region. 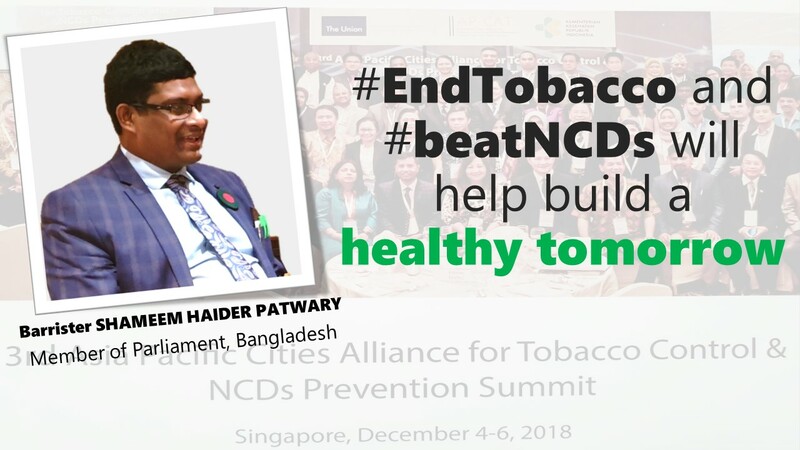 "We can share the experiences of Mayor in Philippines, or other sub-national leaders" with people we work with, to improve programme outcomes in tobacco control as well as prevention of NCDs, said Barrister Shameem Haider Patwary, MP from Bangladesh. 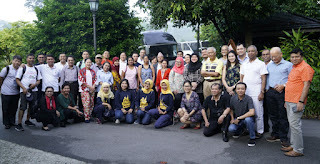 On the second day of the 3rd Summit of AP-CAT, several local leaders including Members of Parliament, Mayors, government officials and public health experts, woke up early in the morning to walk/ run and increase physical activity in the historic Botanical Garden in Singapore. This Botanical Garden is the first and only tropical botanical garden inscribed as a UNESCO World Heritage Site since 2015. The entire garden is a no smoking zone. Jose Luis Castro, Executive Director of International Union Against Tuberculosis and Lung Disease (The Union) and President of NCD Alliance board, said that NCDs kill over 40 million people every year. "We have to see human lives behind these statistics and data, as people dying untimely due to NCDs are part of families and communities." Jose Luis Castro reminded participants of 3rd Summit of AP-CAT that two important UN high level meetings (UNHLMs) to beat NCDs and end TB were held earlier this year alongside the UN General Assembly where heads of 193 countries were invited. He laid emphasis on pivotal role of political leadership and commitment at evey level (sub-national, national, regional and global) to beat NCDs and avert untimely deaths and preventable epidemics.